My favorite tech news aggregator, Techmeme has just introduced the mobile version of their tech news aggregation site. Techmeme Mobile runs smoothly on popular smartphones including iPhone, Droid, Palm Pre and some other devices. Now this is something that I was really looking forward to as I check Techmeme very often on a regular web browser. 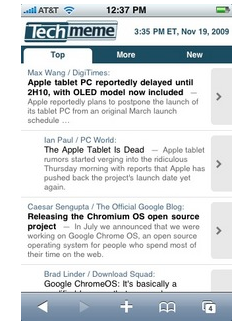 To check out Techmeme Mobile, you simply point your phone’s web browser at http://techmeme.com/m. If you check it out using the previous http://techmeme.com, you will be redirected to the Techmeme Mobile site. You can also opt to stay on the stardard Techmeme site by simply clicking the link at the bottom of Techmeme Mobile. If you’re an iPhone user, although Techmeme Mobile is not a native iPhone app and just an iPhone optimized website, you can still add the cool Techmeme icon on your application home screen by simply pressing “+” at the bottom of the browser, then tap “Add to Home Screen” and you’ll have the icon.